Throughout the United States, many firefighters have been killed by the unexpected collapse of burning buildings. Unfortunately, when a building collapses during a fire, it can be sudden and cause large numbers of firefighter deaths and injuries. Over the years, we have seen, heard and read about these collapses, and sometimes they can even occur in our own community. Many of these tragic events are etched in our minds forever. Some of the most notable building collapses which have caused firefighter deaths since the turn of the century include: Chicago, Illinois stockyard building collapse, 1910, 21 firefighters killed; Philadelphia, Pennsylvania, leather factory fire, 1910, 13 firefighters killed; New York City drug store floor collapse, 1966, 12 firefighters killed; and the Boston, Massachusetts Hotel Vendome collapse, 1972, 9 firefighters killed. With out question, the most tragic collapse event in firefighting history is the recent collapse of the World Trade Centers in New York City where 343 firefighters lost their lives on September 11, 2001. Although some of these events became well known parts of our history, others did not. Very few people are aware of one of the most disastrous burning building collapses in our nation’s history – The Strand Theatre Fire. The fire took place in Brockton, Massachusetts on March 10, 1941. Thirteen firefighters were killed when a roof collapsed while the men were operating on a balcony. To date, this is the third largest loss of life to firefighters from a burning building collapse along with Philadelphia’s leather factory fire in 1910. In 1941, the City of Brockton was ranked thirteenth in size among Massachusetts cities. Well-known for its thriving shoe industry, this working class manufacturing city was known as the hub of southeastern Massachusetts. Located 20 miles south of Boston, with a population of 60,000 and an area of 21.5 square miles, Brockton was said to be among the most active and prosperous communities in the commonwealth. The City of Brockton Fire Department was highly dedicated and professional in 1941, with 123 paid firefighters operating five engine/hose wagon companies, three ladder companies, and a specialized squad company from six fire stations. Brockton firefighters at the time received $35.40 for an 84-hour work week after having received a pay cut seven years prior. The Strand Theatre was first erected in 1915 on the site of a previous theatre which was destroyed by fire on April 7, 1915. The newly-constructed Strand was formally opened in March, 1916, touting its modern fire safety features. The theatre, which was located on an irregular-shaped lot, measured 74 feet of frontage, 32 feet in the rear and 139 feet deep with a height of 60 feet. A seating capacity of 1,685 was allowed making the Strand the largest playhouse in the city. Walls were of brick and the roof was made up of wood boards on joists supported by unprotected steel trusses. The interior walls were metal lath and plaster as was the ceiling, which was suspended from the wood trusses. The balcony covered a large area above the auditorium and housed a manager’s office, usher’s room and rest rooms. The area under the auditorium was dead space with the exception of the west end of the basement were finished rooms contained the furnace, ventilation equipment and a janitor’s room. The lobby was an open area with two open stairwells on each end providing access to the balcony. A long corridor connected the lobby to the School Street side. Fire Protection features included a dry pipe sprinkler system in the stage area which was termed "fireproof". Surface exits provided were reported to be 20% above those required by state law. 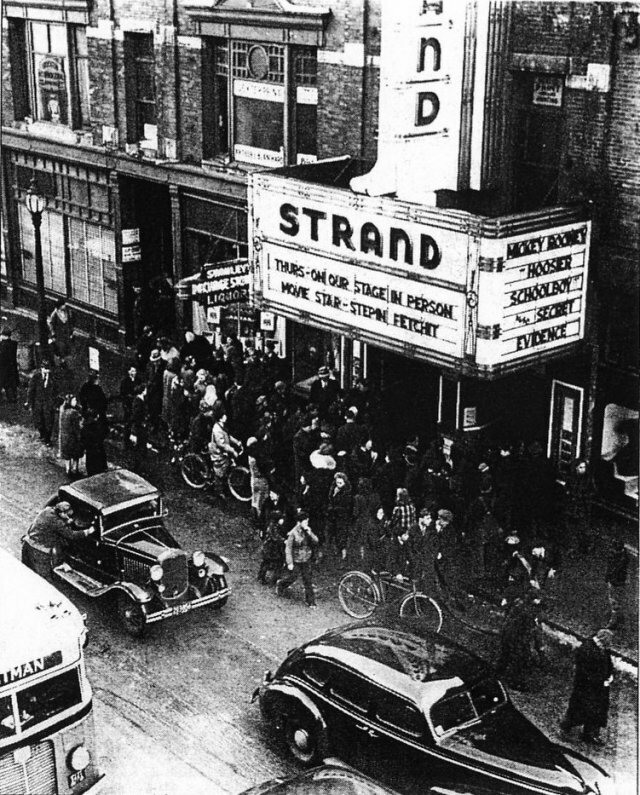 In August, 1937, the Strand Theatre underwent extensive remodeling and improvements under new management. The building remained intact under the new management until the fire occurred. In the heart of Brockton’s business district, people usually flocked to the downtown area to shop or take in a show in what was a busy part of the city. Sunday, March 9, 1941, like all other Sundays, drew large crowds looking for the entertainment of a movie or vaudeville show. The Strand Theatre, located on a large block at the corner of Main and School Streets, was showing the film "Hoosier School Boy" starring Mickey Rooney. "Secret Evidence" filled out the double bill. Long after the last show, the night custodian discovered a fire in the basement and instructed his helper to activate the fire alarm box located at Main and High Street. At 12:38 a.m., the fire department received box 1311 and sent the first alarm apparatus to the scene. A second alarm followed shortly after the first, and finally a general alarm was sounded bringing all of Brockton’s apparatus to the Strand. When firefighters first arrived, all indications were that they were not dealing with a very serious fire. However, as time progressed, the fire gained headway. This became more apparent to those on the outside of the theatre than crews working inside. The fire started in the basement and was knocked down by crews with cellar pipes while flames raced through the vertical voids in the walls and ventilation ducts. Firefighters worked feverishly to extinguish hidden fire while crews opened walls and ceilings in the lobby and under the balcony. A number of men moved up to the balcony to attack the fire which had made its way to the auditorium ceiling just below the roof. Less than one hour after the initial alarm, the Strand Theatre fire changed the course of history for the City of Brockton and its fire department, particularly for those men working on the balcony. Suddenly, without warning, the west section of the roof came down in a crash that rested its weight on top of many unsuspecting firefighters and knocked several from the balcony and roof to the auditorium below. Remaining, uninjured firefighters worked diligently in the chaos and rubble to free their comrades despite the danger and fear of further collapse. Eventually, fire departments from surrounding towns relieved crews from Brockton. Later that morning, the dead and injured firefighters were removed from the scene as the department and outside agencies faced the difficult task of determining the cause of the fire and the subsequent collapse. In all, 13 Firefighters were killed, and more than 20 injured when what was termed a routine fire, turned into disaster. Since then, each year on March 10th a commemorative service is held at Brockton City Hall where a monument rests in honor of the men who died. No definite cause for the fire was ever discovered. Initial reports that the fire was arson proved to be inconclusive. Further investigation revealed that the unprotected steel roof trusses played a major role in the collapse. The heat of the fire within the concealed space between the roof and the auditorium ceiling was believed to have distorted the steel trusses, causing them to buckle and separate with ease. Experts questioned the effectiveness of the construction and design used in the roof assembly. Some reports state that the weight of a previous snowfall may have added to the collapse. However, witness accounts and photographs indicate a minimal amount of snow. It is important to note that many older structures of similar design and construction to the Strand Theatre still exist in the country today (particular in older cities). Attention should be brought to the potential collapse danger of these unprotected steel truss roofs in an effort to prevent similar tragedies. Strand Theater on March 10, 1941 in the performance of their duty.